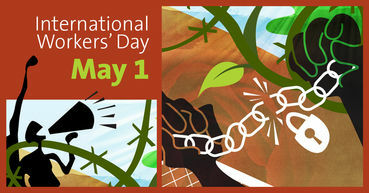 May 1, International Worker's Day! This day was always meant to celebrate the work of the everyday man, so if you’ve been feeling a bit underappreciated recently, today is the day for you to do what you feel like doing and treat yourself! Take the day off (if it’s not a day off work in your country of residence) and go do something you want to do for a change. Has it been ages since you visited the mountains? Pack a lunch and spend the day enjoying nature and the view from the peak you decide to conquer. Has your back been causing you increasing discomfort recently? Time to make an appointment with a good masseuse! And if it’s been forever since you took the time to make yourself a decent meal, today is the perfect day to buy all of the ingredients you need and spend as much time as you need cooking something delicious and nutritious. If you’re feeling a bit more politically inclined, you could attend one of the many rallies or marches organized in many cities worldwide dedicated to raising awareness about wages and working conditions. After, the first step towards making any kind of change is making people aware of the issue!" For you all as well! It was very relaxed day, Ben. Thank you very much.